Notes on the background and development of Key Colony Beach, Florida. A presentation to the Key Colony Beach Chamber of Commerce “Town Meeting” in conjunction with the City Commission of Key Colony Beach, February 28, 1984. Just by way of letting you know that I am not of only recent acquaintance with the Florida Keys, let me go back in time for about fifty years. Sarasota, on the Florida west coast, was home. The name, Florida Keys didn’t mean too much. However, mention the name Marathon among members of the commercial fishing fleet and you would be on familiar ground. Marathon, in the 1920’s and 1930’s was winter home of commercial fishermen from both the east and west coasts of the state, all in search of the then plentiful kingfish. These were hook and line fishermen; the great nets of today’s commercial fleets was either unknown or unaffordable. These fishermen came by the hundreds. The name Marathon was synonymous with kingfish. My very first look at the area was during the summer of 1932. It was vacation time from the University of Florida. Vacation time meant a couple of weeks of sailing time with school buddy, Clinton Johnson. We had sailed our 21 foot open boat from Sarasota out to the Marquesas, into Key West and were sort of coasting back towards home. We put into this place called Marathon to take on a few staples and find a couple of jugs of water. We docked at a rough and tumble facility at just about where the Marathon Yacht Club is now located and made our way the long block up to the commercial center of the village of Marathon. That being the intersection of the railroad track and the rutted path, one car wide, from the docking area. “The Store” was what you would call a general store owned and operated by a Mr. Woodburn. We made considerable purchases of canned milk, vienna sausage, corn flakes and pork and beans that exhausted our meager finances. We asked about fresh water and found two kinds were available. Five cent water and ten cent water. The ten cent water was from a clean tank that was supplied from tank cars railroaded down from Homestead. The nickle per gallon water was something else. This was from a large cypress tank into which was collected rainwater from the store building’s roof. This you could say was quite a bargain, considering all of the proteins that came with the water; proteins in the way of mosquito larvae and wiggle tails. No problem really. You just strained the water through a handkerchief or drank the water in the dark. Either way, the additives didn’t seem to bother us much. Sailing up the bay we passed Vaca Cut, Pull `N Be Damned Creek, noticed the names Fat Deer Keys and Shelter Key on the chart. 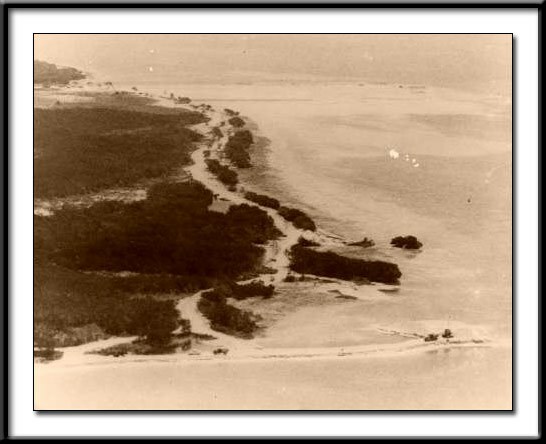 Fat Deer Keys were several islands beginning at Shelter Key (now Key Colony Beach) and including what is now Coco Plum and several other smaller islands to the east. Incidentally, there was no passage through Vaca Cut at the time. Most of the smaller openings between the islands had been filled in during the period of railroad construction 1906-1912. It was easier and less expensive to fill rather than to construct bridges. 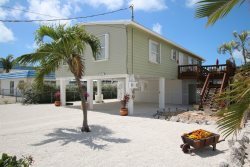 The great and exclusive resort, the Long Key Fishing Camp, founded by Zane Gray in 1916, was located on the western tip of Long Key. This was a complex of buildings left over from the railroad construction period and redesigned into a retreat for affluent sportsmen around the world. Some 30 cottages were installed in a park like setting of a tropical coconut grove. A two story building served as lobby, recreation room, restaurant and hotel. We docked our twenty-one footer at the club marina, on the bay side where the Edgewater Lodge is now located. An elderly couple invited us to lunch in the club house. After hearing lively tales of our sailing adventure, the same couple again invited us to the evening dinner, even engaged one of the sleeping rooms for us for the night. I have always been proud of the fact I was privileged to spend a night in the somewhat historic building that was completely blown away just three years later in the great hurricane of 1935. The next time I had a connection with the Florida Keys, I was editor of the Florida State News Bureau in Tallahassee. This was the publicity and promotional arm of the Florida State Development Commission, now the Florida Department of Commerce. Into my office one day, came a short, rotund, jolly man who introduced himself as Phil Sadowski, developer of Marathon Shores. For about two hours I heard great and glowing tales of what was happening in the Florida Keys. Especially with reference to what Phil Sadowski was doing. My summation at the time was, this guy must be on dope. No one pours that kind of money into those swampy mangrove islands. How wrong I was. During the early fall of 1953 I was involved in a Key Deer count with the Fish and Wildlife Service and the Boone and Crockett Club (which was instrumental in establishing the Key Deer Refuge). The toll road was still collecting fees then. After the survey was complete on Big Pine Key, I stopped in to see Phil at his office in the new hotel he had under construction. It was then named the Key Colony Hotel, later became the Jack Tar, then Salty Dog and now is a cooperative, the Ocean Isles Fishing Village. Phil, gracious host that he was, treated me to all the amenities. Early the second day of my visit I was hustled into a work boat at his marina on the ocean side of the closed Vaca Cut. Out toward the ocean, Phil first pointed out a small mangrove covered island, eventually to become Yacht Harbor Island. Next came a much larger, but equally low island, but with an ocean beach. This, my host pointed out, was going to be his finest achievement, Key Colony Beach. With great good gusto, as we traveled along off shore on the ocean side of the island, Phil pointed to one spot and announced this would be an ocean front apartment building, next would be a two hundred seat restaurant and bar, and a three story hotel would be right over there. Of course, I was seeing nothing but water and a ragged looking beach. My reply to all of this was, “Mr. Sadowski, that is 18 feet of water you`re pointing to. Well, as you can see today all of the buildings he mentioned, and others were built as predicted. Phil was a great one for getting the finest of free publicity. He became associated with the Florida Outdoor Writers Association and had this group as his guests for semi-annual conferences twice while he was still pumping in what was to be Key Colony Beach. After the island was habitable and two hotels, a restaurant and this auditorium (now City Hall – 600 West Ocean Drive) were built, he invited the Outdoor Writers of America Association to choose his island for the location of their 1958 convention…..The writers came 800 strong and just about taxed the entire room market of the mid Keys. This building was officially dedicated to the Outdoor Writers of America with a large brass plaque at the front door confirming the fact. The brass plaque was later blown away in Hurricane Donna. Retrieved, it was thought to be of no great significance. Personally I delivered it to the Association during the annual seminar in Macon Georgia in 1977. It is now displayed in the organization’s headquarters in Phoenix, Arizona. In addition to outdoor writers, Phil was on the watch for travel writers, real estate writers, business writers. In fact, just about any qualified journalist found a haven and a wealth of information on the Florida Keys, especially about Marathon Shores and Key Colony Beach. Naturally, all of this resulted in reams of favorable publicity for the Sadowski product with many side benefits to other business ventures in the area. 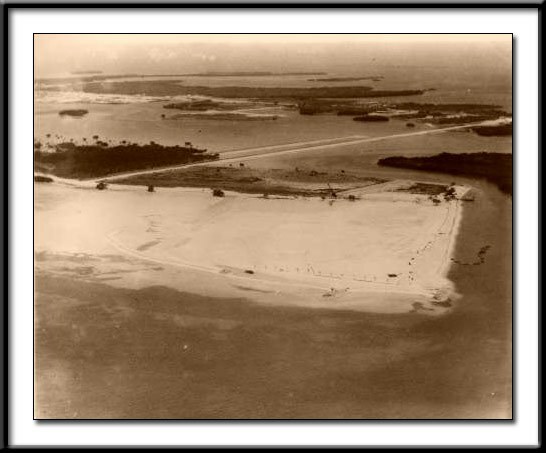 Shelter Key, of the Fat Deer Keys, later to become the City of Key Colony Beach, was originally, 97 plus acres of low laying island. There was a sandy beach on the ocean side, but most of the land was marginal, even flooded in periods of high tides. In the early 1950’s a pair of Sadowski dredges began an around the clock pumping operation. The small island was extended both south and east. Eventually, it spread even to the north until the small island had grown to almost 400 acres. Marl from the bayside was dredged and pumped over the land. On the ocean side, Sadowski had purchased the ocean bottom, legal at that time, for a distance of four hundred feet from the shoreline. This was a coral sand bottom which was dredged and pumped in as the final fill on most of the island. It was only after the fill was solid that dredges began cutting in the canals putting the material from the canals over the original fill to bring the island to six feet above mean sea level. Heavy cypress timbers were used to construct seawalls to hold back the filled land. The cypress walls had an expected life of 20 years. And, they made it, but that was about all. Sea wall requirements now are strict and must conform to the city code for such structures. During 1956 and 1957 the leaders of the community of Marathon were seriously talking of incorporation. 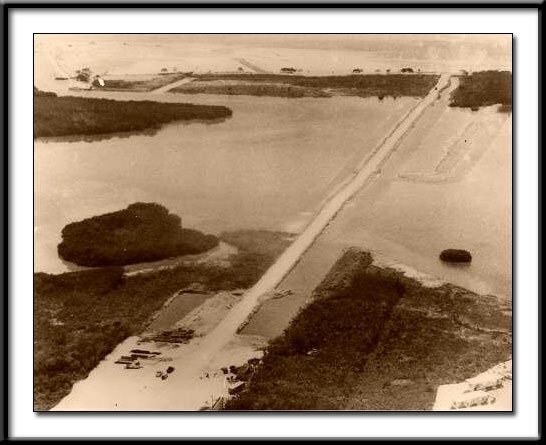 As presented by the pro-incorporation group, the plan at one time, was to include all of the community of Marathon, Marathon Shores, what was to be Key Colony Beach and extending even to Duck Key and possibly Conch Key; a real ambitious project. A great rally and a straw vote on the matter, held at the ball park during a town hall type meeting saw the project soundly defeated. This happened on three different occasions. It was not at all unknown that Phil Sadowski had been dreaming of incorporation of his growing jewel of an island. The fear of the island being swallowed up in a blanket bill, such as had been proposed by the Marathon group, prompted him to begin in earnest, incorporation for the small but rapidly growing and developing island. A Miami lawyer was engaged to draft articles of incorporation which were passed by the Florida State Legislature in June 1957. These were presented to the 11 freeholder families then living in the community of Key Colony Beach September 24, 1957. The vote for the acceptance of the articles was 100% favorable. The community became the City of Key Colony Beach by this approval. There is no one living on the island who was an appointed member of that first city commission. All were investors in some manner of beach property. Of course, Phil was selected Mayor by the appointed members of the first council. I don’t believe there is either point or time to go into any of the many early problems of the city. Growing pains they were, mostly. A big event on a sunny, spring Sunday morning in 1957 brought national press coverage and three days of comments on the popular Arthur Godfrey radio show. On that Sunday morning, I was awakened by a pounding on the front door and with the shouts of Charlie, get your camera and come on……..well, the excitement was a boiling threshing muddy affair being created by, believe it or not 50 to 75 whales that had found their way into the bay and were stranded in shallow water at about the area where the marina is now. These were black fish or so called false killer whales. These mammals ranged from 15 to 35 feet with a weight estimated in tons. It was probably one of the greatest free attractions ever in the mid-Keys. The highway patrol was called to untangle traffic snarls on the muddy, rutted causeway. Efforts were made to tow the creatures back out to sea, only to have them turn right around and come back and become stranded on the beach front. Here they died and began drifting away. Many were blown back on different areas between here and Marathon. For a week or more I was getting calls telling me to come get my whales off someone’s beach or water front. One of the big events of 1958 was the inaugural year for the well known and respected Key Colony Beach Sailfish Tournament. This was another Sadowski promotion that drew some 60 top flight sports anglers. At the time, Guy Lombardo and his brothers had an option to purchase the Colony House Restaurant (on East Ocean Drive). The musician and Phil were hosts for the fishing event. The competition was billed as the Guy Lombardo Tournament. Lombardo brought his entire troop of Royal Canadians for a two evening performance right in this hall. One night was open to the public, the second evening strictly for tournament participants. Real estate was moving at a very favorable pace. There was even a bi-weekly mail out type newsletter, The Beachcomber, that told of happenings on the island. The idea of botels was catching on as these unique duplex residences were built along the Causeway and the length of Seventh Street. This too, was 1958 and 1959………the selling price of the botel units were selling for $21,500, both sides, furnished and with a dock installed. Prices of the ocean front apartments were comparable. September 10, 1960 was a time of disaster. That was when we had a visit from the wild and windy lady, Hurricane Donna. To the best of knowledge, only one person remained on the island that night, Captain Harry Eville, then an employee of Ruttgers Motel, remained in that building. Between six p.m. on that Saturday evening and six a.m. Sunday morning, winds reached an unbelievable 180 miles an hour; this from a reading at the then manned Sombrero lighthouse. At the time about 70 homes had been constructed on the island. An aerial photo survey on the day after the howling storm revealed only one complete roof. Some homes were completely de-roofed while others had sections blown off. A number of walls had collapsed almost totaling the house. All construction had been to Southern Building Standards. However, without the precaution of boarding up windows and sliding glass doors, the great wind blew out the glass, compressed the air in the buildings and actually lifted the roof right off the building. The island was a shambles. But, by virtue of being an incorporated city with its own governmental body, the city was given a federal grant to clean up the debris and to clear all canals of flotsam that would hinder navigation. Monroe County received a grant of federal funds which were sort of doled out to the communities of Marathon, Layton, Islamorada and other areas of significant damage. Key Colony Beach was the first area returned to something like normal. Actually, water was not available for almost a month, electricity was off for two weeks. Our one connection to the outside world was a single telephone. The mayor, Arthur Sterrit, prevailed on Southern Bell to run an on the ground, under the water extension from the pay phone at the Key Colony Beach Motel to a connection near Vaca Cut. And, it worked. In fact had a great business and constant line up of people. This phone was three weeks after the great blow. All of the island debris was piled high in an area of about the present Tall Condo. It made one great bonfire as the torch was applied. That one roof I mentioned a moment ago was on the home of…….you guessed it, the Andersons. Our home had been completely boarded up or shuttered. One window was broken and that was the extent of the damage. About high water, there was absolutely no raising water on this island except for one small area adjacent to the then wooden bridge on the Causeway. After the storm, real estate prices went on the skids. This condition lasted for about 18 months before beginning to escalate back to what might be called a norm before the storm. Then came New Years 1961. Fidel Castro was marching into Havana. Eventually, the missile crisis reached a boiling point. Several anti-missile units were erected at key points throughout Monroe County. Many residents began to get the jitters, packed up and actually removed themselves from the Keys. Many of these families left the Keys permanently. Once again, real estate prices dropped drastically. Lots that had been on the market for five to eight or nine thousand dollars, tumbled to far less than half of the original price. Those same lots purchased by prudent buyers today are hard to find at 25,000 to 30,000 dollars. It was another four years after the Castro regime took over in Cuba before matters in the Keys began to stabilize. Perhaps the biggest and longest period of community dissension occurred in the late 1960’s. This was the matter of installing a municipal sewer system for the entire island. This question brought about a bitter split among friends and neighbors on the island. Three families actually sold and left the island because of the bitterness created among neighbors. However, the city commissioners, looking to the future, won the matter and federal funds were granted for the system’s construction. Now, like Mark Twain once stated, “I don’t have time to write a short letter”, I don’t have time for a short history.